Two-toned rings may be all the rage, but we thought we would up the ante by pairing two different finishes in one fashionable package. 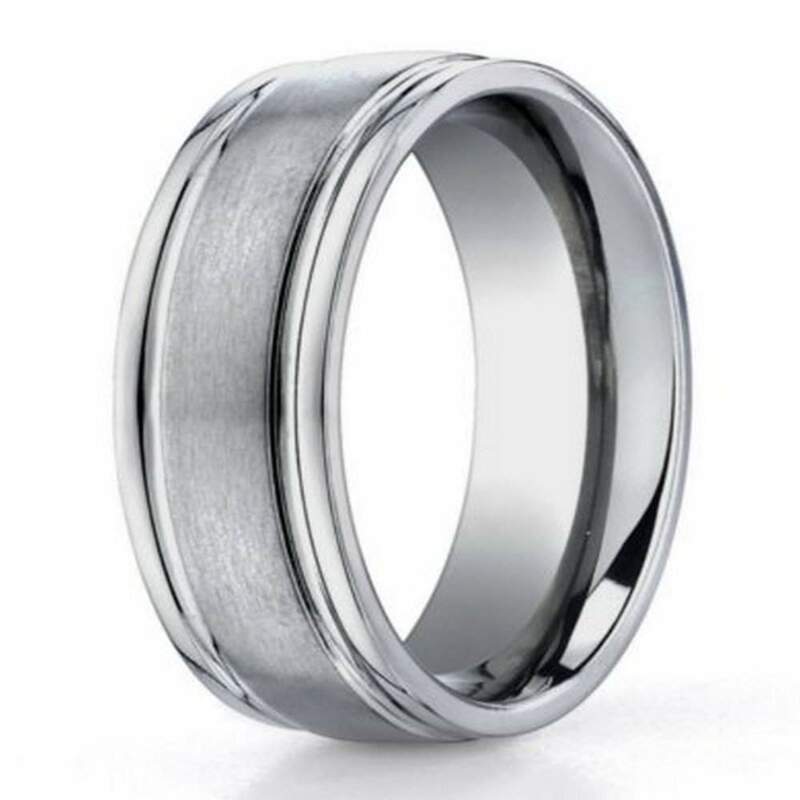 Our men’s benchmark titanium satin finish rounded edge men’s wedding ring is an utterly sleek and sophisticated solution for any groom with great taste. The satin finished center is complemented by the highly polished edges. This fashion ring is made of aircraft-grade titanium, which is lightweight yet extraordinarily resilient. Titanium never corrodes, dents, scratches, or loses its shine – talk about a man’s ring! Each 6mm benchmark titanium satin finish rounded edge men’s wedding ring we offer is designed in the comfort fit style, which is ideal for men with large knuckles. Resizing may be tricky down the road, but some jewelers are willing to resize titanium as your fingers change over time. The benchmark titanium satin finish rounded edge men’s wedding ring is featherlight and ultra comfortable to wear all day long. We offer a wide variety of sizes to suit any need. You can also add a custom engraving up to 30 characters in length. Commemorate this special occasion with your wedding date, your initials, or a promise for your soon-to-be spouse. Comfort fit rings usually measure a half size smaller than traditional rings, so we recommend that you have your ring finger sized by a professional jeweler to determine whether a comfort ring is right for you and your lifestyle. If you have any questions about our 6mm benchmark titanium satin finish rounded edge men’s wedding ring, please contact JustMensRings.com today to speak to one of our customer service representatives. Excellent service! Great quality! Saved us a ton of money!! Highly recommend ! I love this ring, it is beautiful and well made. Just make sure that you know your size because I took it to my jeweler and was told this ring can't be resized. We received this ring and are very impressed by the quality for money. Thank you again.